IF the quality of the pitch at Taunton matched the quality of the setting, there would be no better place to watch cricket in England. As it is, one spends half one’s time watching batsmen making hay on the inevitable flat surface, and the other half staring at the much more arresting sight of the Quantock Hills, which have gazed down on all the Somerset greats: Richards, Botham, Garner, Gimblett, Wellard, et al. Of course, there is always a chance that spectators will yet see a positive result in this match, either through events taking their natural course or through collusion. But with only eight wickets having fallen in six sessions, and with indifferent weather forecast for tomorrow’s final day, it feels no less likely to be a draw than it did before champions Yorkshire set off. To judge by the way that things have gone so far, the visitors would be far from disappointed with a share of the spoils. Andrew Gale would certainly have hoped for much better than for his side to have conceded 562-7 declared after he took up the right of the visiting captain to field, Yorkshire replying with 127-1. At one stage, the Somerset score was 531-4 before they lost their last three wickets after lunch yesterday chasing quick runs. Otherwise, the inconsistency that has dogged Yorkshire’s bowling continued, with the opening pairing of Jack Brooks and Liam Plunkett returning combined figures of 44-3-193-0 and only Steve Patterson and Will Rhodes giving Gale control. Adil Rashid took four wickets, but he conceded 160 runs in the process at not far short of five runs an over. Only Patterson conceded fewer than three an over, while Yorkshire’s fielding was occasionally ragged. The pitch was certainly a mitigating factor, with Gale having long felt that sides deliberately prepare flatter surfaces to negate Yorkshire’s bowlers. 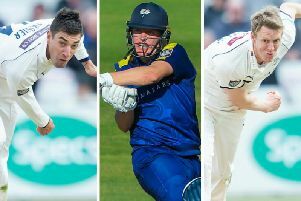 But with all of their cylinders yet to fire, and without their injured talisman Ryan Sidebottom, Yorkshire are doing little to suggest that they warrant special treatment. Indeed, they should have been under much more pressure after being left to score 413 to avoid the follow-on, only for Somerset to spill openers Adam Lyth and Alex Lees early in the piece. Lyth, on two, was dropped from the 10th ball of the innings by Tim Groenewald, who grassed a presentable chance in his follow-through as he thrust out a right hand. Lees, on seven, was badly shelled by Jim Allenby at slip off the spinner Jack Leach. Had those catches been grabbed, Yorkshire would have been sliding towards familiar 40-3 territory without England’s Jonny Bairstow to ride to the rescue. Instead, Lyth prospered to the tune of 80 and Lees to 33, the pair sharing Yorkshire’s first century opening stand in first-class cricket since the first Championship match of last year, with Somerset blowing their chance to make key early inroads. Yorkshire started day two much better with the ball than they had day one, keeping the overnight batsmen James Hildreth and Peter Trego relatively quiet in a first hour that brought 56 runs. But on another glorious day in the sunny south-west, albeit slightly cooler than on Sunday, Somerset stepped on the accelerator as 95 runs flowed in the second hour, making it 151 for the session for the loss of no wickets. Yorkshire had no answer to Hildreth, who advanced from 68 overnight to 151 at the break, or Trego, who moved from seven to 71 at lunch as runs flowed comfortably. Hildreth’s hundred, reached from 160 balls with 11 fours, was his second of the summer and his third against Yorkshire, while Trego showed familiar power when he launched Rashid into the upper tier of the Sir Ian Botham Stand and then Lyth into the upper tier of the new Somerset Pavilion. The fifth-wicket stand was worth 199 in 46 overs when Trego tried one drive too many at Rashid and was caught behind for 94, the third batsman to fall in the 90s after Marcus Trescothick and Chris Rogers on day one. Hildreth followed in Rashid’s next over when he got a leading edge back to the bowler, his innings of 166 – accumulated from 237 balls with 17 fours – eclipsing his previous best against Yorkshire of 115 here three years ago. When Jamie Overton was caught on the mid-wicket boundary by Lees off Patterson, one ball after he pulled the same bowler over long-on into the River Tone, Somerset declared earlier than many had expected. After their early let-offs, Lyth and Lees played nicely before Lees edged Overton to third slip, Rhodes helping Lyth to see out the day.